We really appreciate what Turkish Airlines has done to make families feel welcome, by offering in-flight toys, family entertainment and healthy dining and drink options on their Trans-Atlantic flights — and now, free tours. 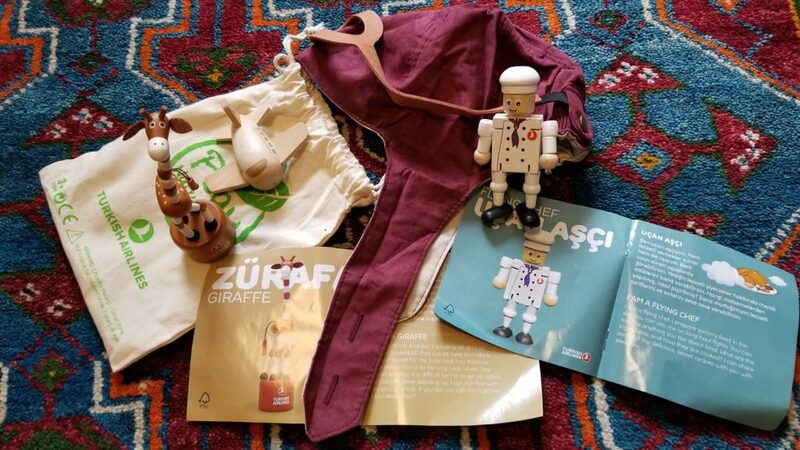 Turkish Airlines all-natural inflight toys, plus an aviator cap, greet family travelers ages 3-12. Yes! A few well-guided Istanbul city tours are available, absolutely free, for passengers in transit with a minimum six-hour layover. With so many sophisticated Istanbul family attractions we think you’ll appreciate the sightseeing time, even if you’re enduring a long layover after a very long trans-Atlantic flight. And despite the current political problems (please check the travel information pages of the U.S. Department of State before booking), Istanbul has enjoyed a tourism boom in relative safety since being Europe’s Capital of Culture in 2010. So here’s the deal: Turkish Airlines is making your layover at Istanbul Ataturk Airport even more productive by offering Touristanbul free tours of 6-9 hours in length, focused on the most significant historical places, for guests transiting Turkey who’ve purchased tickets on Turkish Airlines. Join it at the Airport’s Hotel Desk at the international terminal; passengers under age 18 must be accompanied by an adult. There’s no need for an advance reservation (ask questions at touristanbul@thy.com), making this a great wait-busting option for those whose flights are unexpectedly delayed. After you book the tour (and they’re given two to three times daily in English most weekdays), you and your family will be picked up by a private tour guide. Whatever luggage is not checked can be stored at the airport for a nominal fee. Unfortunately, there is no special service for the mobility impaired. All expenses for transportation, meals (and they have vegetarian options) and museum fees will be taken care of by Turkish Airlines. By the way, business class passengers with a seven-hour layover also have the option of an Istanbul Bosphorous sightseeing tour by boat — meal at the magnificent C?ragan Palace Kempinski included — from €183 and up. Starting in summer 2018, the Stopover service is for transfer passengers departing from all nine US gateways and flying to Africa, Eastern Europe and Balkans, South Europe, Pakistan, India, Bangladesh, Russia, Iran and Kazakhstan. If you have more than 20 hours of connection time in Istanbul, your family will receive complimentary accommodations in centrally located neighborhoods and the opportunity to explore more of Istanbul. Economy class passengers will receive a one night stay at a 4-star hotel in Sultanahmet, while those flying in business class will enjoy two nights at a 5-star hotel in Taksim. Travelers will receive accommodation vouchers from Turkish Airlines’ authorized staff after completing the flight booking process. For more information about arranging the Stopover, please visit Turkish Airlines site or email freehotelusa@thy.com and let us know what you saw. someday i will go to Istanbul for Holiday…. I've had such bad experiences with the customer services at Turkish Airlines. ON the phone, the managers who are supposedly "English" do not understand simple sentences and when they don't, they get frustrated and hang up on you. We had a multi-leg trip with Turkish Airline from Rome to Istanbul to Cairo to Athens. We only ended up taking the flight from Rome to Istanbul. Their flight from Rome to Istanbul was comfortable and relaxing. The staff was cordial. We only had carry-ons because of the horrible experiences other users have had. Our overall experience with management, however, turned out to be extremely frustrating and awful. Our first interaction with them was when we tried to cancel our Istanbul to Cairo part of the trip because the US department highly suggested that no US citizens should travel to Cairo. We had called Turkish Airlines prior to the trip, but the staff spoke limited English and didn't understand that we wanted to cancel only one leg of the trip. They would planning on canceling the entire trip which we didn't want. We then decided to keep the trip but use one of the layovers that was originally intended from Cairo to Greece but stops at Istanbul to get to our final destination- Greece. However, due to their international rule and regulation, they canceled our entire trip leaving us no way to get to Greece. They didn't inform us via email or phone like many other airlines do. We found out the day before we were supposed to leave when trying to check in for our flight. We accepted the fact that there was nothing we could do but when we asked on the phone what we could have done to have prevented this, the manager started yelling that she couldn't help us, and that it was our fault for losing the tickets. We asked again. She admitted that she couldn't understand our question and started shouting at us that it was our fault and hung up on us. I was furious. Looking at the other posts, I think the moral of the story is – Do NOT book with Turkish Airlines unless you speak Turkish. The staff's English is very limited, and trying to change flights or dealing with management is just a pain, ends up with customers losing money and valuable time. If you do not speak Turkish, avoid the airlines no matter how good that deal seems. The customer service is non existant. Istanbul layover tour is a great service to use the best of your time in Istanbul Airport. However if you like to have a private attention and flexibility, you can check private tour services of ISTANBUL LAYOVER TOURS. They are offering the layover tours from Istanbul International Airport.